Dr. Hoang Lien Anh joined Cao Thang by end July, 2018 and currently working at consultation department, Cao Thang Eye Hospital (CTEH). 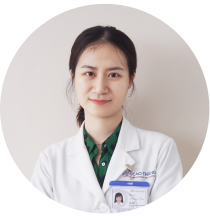 Dr. Lien Anh obtained General Doctor degree by Vietnam Military Medical University in June, 2014 and has focused on the ophthalmology subspecialty and Dr. Lien Anh further earned Master of Medicine in Ophthalmology, University of Medicine, Ho Chi Minh City, Vietnam in September 2017. Moreover, Dr. Liên Anh has completed the ophthalmologic courses such as certificate of refraction by Ho Chi Minh City Eye Hospital and certificate of orientation in ophthalmology in 2015, plus the certificate of ultra sound for eye doctors by Ho Chi Minh City Eye Hospital in 2017.